You can control your own destiny and a Bark Busters franchise gives you the flexibility and fulfils your dream of running your own business. 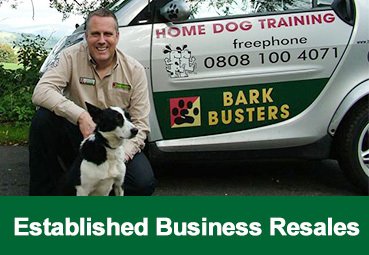 A Bark Busters franchise is the perfect opportunity to work for yourself and to be safe in the knowledge that you're backed by the world's largest in the industry, with over 1 million dogs trained, 300 offices worldwide and over 30 years' experience. Our business provides a strong, protected brand with the advantage of running a business to suit your circumstances and lifestyle choices. You have the benefit of a worldwide business, established in 1989, behind you. With our proven dog training techniques, unique worldwide guarantee, excellent web presence and state of the art IT systems our business model gives you an immediate advantage in the industry. As world leaders in dog training and behaviour our trainers also receive a high referral rate from dog owner's friends and family. Working with dogs is very rewarding and dog owners are passionate about their pets as can be seen from the many Bark Busters reviews and testimonials received each month by our business owners. Dog owners really appreciate the friendly personal service a Bark Busters trainer provides for all of their training and behaviour needs. 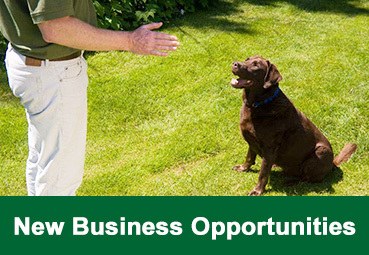 A new business opportunity provides a great way to mould a new business to suit your needs. As the areas are unestablished and have no customer base you are able to develop the business to your circumstances. This can be advantageous as the cost of the areas is lower but may take a little more time to build a customer base. However with a little hard work and our marketing launch, including your own local website, you’ll see your business start to grow in no time at all. New greenfield areas can be an ideal way to mould the future you’ve always dreamed of.